"'I want to remind people how beautiful they are.' 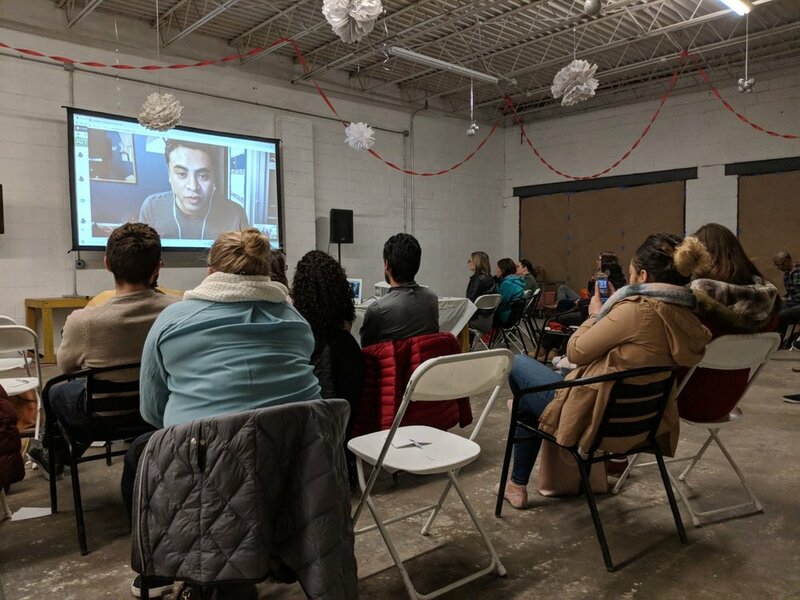 Armando Ibanez, Director of 'Undocumented Tales' talks about his struggles coming out as a filmmaker, undocumented student, and queer. Ibanez hopes to inspire others to find their voice." Why did you pick a web series as the medium for this project? As a kid, I always dreamed of becoming a filmmaker. I watched the 2015 Emmy’s when Viola Davis was the first African American woman to win an Emmy for the best actress in a drama series. She said something in her speech that impacted me. She said, “You cannot win Emmys for roles that simply aren’t there.” This convinced me that I need to share my story for entertainment. I used to complain about not seeing enough people of color, LGBTQ people. I realized I should stop complaining and go to work and make the change. After that, I sat down and started writing Undocumented Tales in September 2015. I also realized that I’m going to be honest and am writing the full story: I’m gay and undocumented. This is me coming out of the closet and out of the shadows. Tell us more about that—about sharing your full story. The undocumented LGBTQ community has to live in two different worlds. Fernando, the main character, hides his identity from family and, in the outside world, he hides his status. I want to show general audiences about our community. There are a lot of stereotypes the media has created about Latinos, but we can’t relate to it. That’s why I want to show this side. We still have hope, we dance, we go to parties. We have dreams, moments of joy and happiness, and I also want to show that. We’re living in critical times in politics and entertainment, and there’s controversy about minorities who are not being represented. I feel like this could be a contribution. "I used to watch films as a kid. I used to fall in love with Mexican films. But growing up as a poor Mexican kid, you don’t dream of becoming a filmmaker. You don’t consider it because you grow up learning to survive. When I came here, I was told the only things I could do were work and work and work and pay rent, and that’s it. So I followed that idea that I wasn’t going to be able to pursue a dream or anything I wanted. Eventually, I started watching more movies. I always felt like I wanted to do something else, and it wasn’t until two years ago when I started seeing many undocumented activists on TV and I was so inspired by these DREAMers and said, who are they? Where do they come from? How can they be so unashamed? I felt a lot of feelings and emotions, and started getting to know activists who I have to say changed my life, and made me feel that I could embrace my identity, and we’re going to see that in the series. Fernando will go through so many situations, meet so many people and they’ll make him consider that hiding and lying is not the right way to pursue happiness." What are the goals you have in making Undocumented Tales? "To entertainment industry people: we need to change representation. The media’s stereotypes aren’t working anymore. 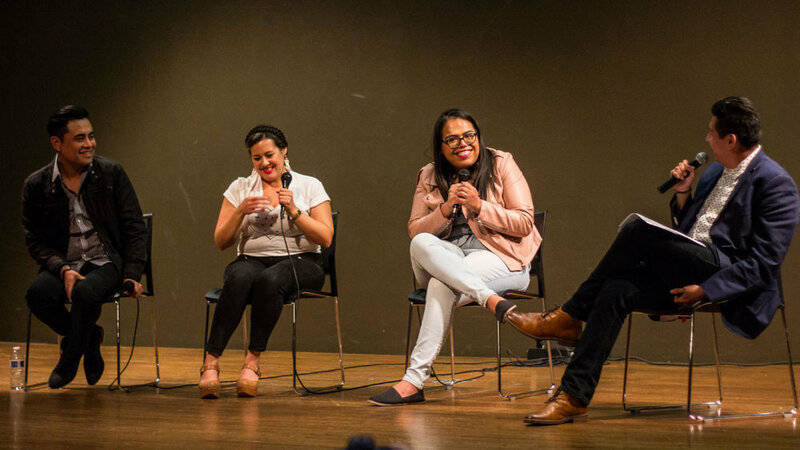 As my experience as a Latino LGBTQ member I have two goals for the series: 1) educate a general audience about who we are and our experiences, and 2) I want my people to feel like they can relate. I want these people to see themselves on the screen and say “He doesn’t have papers! That’s me.” I want to make them feel better because often as undocumented LGBTQ we go through so much anxiety and depression. I want to let them know that they’re not alone. I want to convince the LGBTQ undocumented community not to give up, know that they’re not alone and that we are many." "The web series is an emotional roller coaster following Fernando through his obstacles: work challenges, trying to get into college, a stressful home environment, shocking love life and involvement in civil rights movements. The film sparked an array of emotions from the audience, making them laugh and cry at various points during the screening. Directly after the show, there was a Q&A with some of the actors involved in the webseries. Ibañez was joined by his co-stars, Mela Lopez and Mia Belarosa. Lopez currently helps with language and accent coaching in Los Angeles while Belarosa plays a transgender woman, Alejandra, in the web series and in reality is also part of the transexual Latinx community. The panelists shared many of their experiences and motivations with creating “Undocumented Tales.” Although they worked long hours and most of those who helped with the project didn’t have much experience, they saw great support from their community. Ibañez wrote the series to welcome people into his world so the public could have a better understanding of the struggles within the undocumented community. 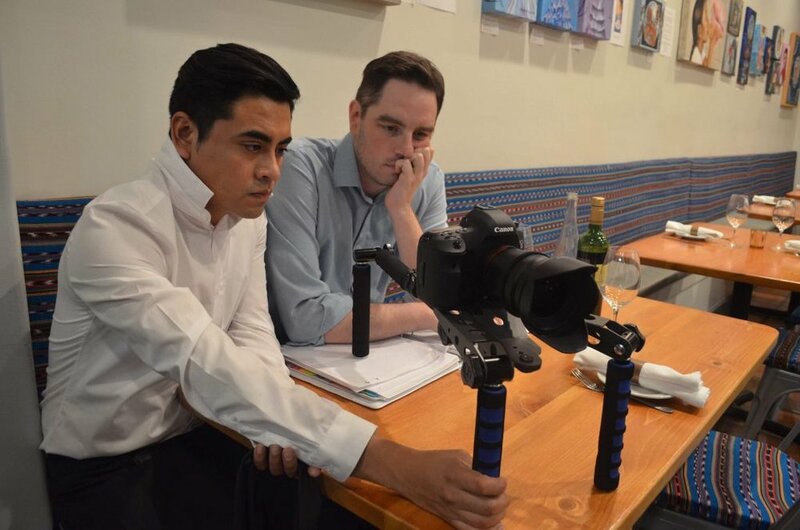 "Armando Ibañez has taken storytelling to a whole other level with his web series, Undocumented Tales which he began in September of 2015. For him, being in charge of how the stories of queer immigrants are told is not something he takes lightly. Ibañez shares with us that the project was created for those who might be feeling a little down as [he] felt years ago. He wants to tell people that no matter the barriers we have, we are powerful. For visionaries like Ibanez, his work is about putting those that are not represented onto the screen. He hopes to bring comfort to those that are struggling to find their place in the world while being queer, undocumented and working class. What began as a project inspired by his love for filmmaking has become a source of inspiration to many. 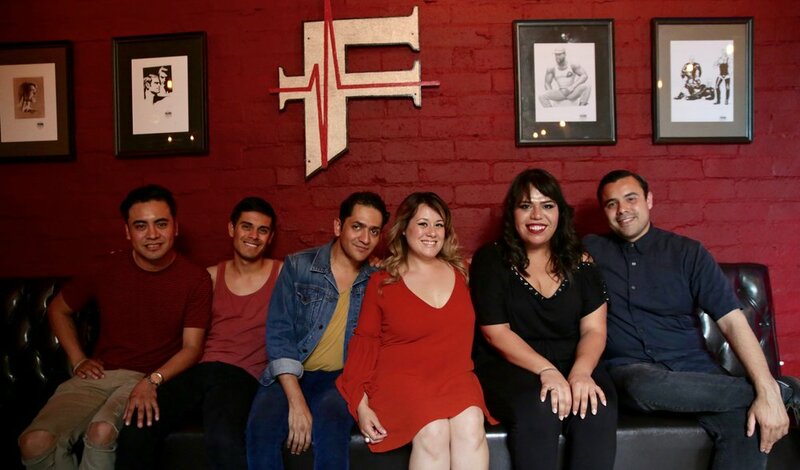 The cast is composed of mostly immigrant queer and trans Latinx people which is a priority to Ibanez and through the power of the internet and with the love of many, Undocumented Tales has gathered significant success." "Ibanez, 35, of Paramount, is committed to portraying authentic Latinx characters and addressing real issues impacting immigrant communities in the United States. “I want to break Hollywood and mainstream media stereotypes about my people,” says Ibanez, who stars as Fernando. “I was tired of seeing films about us only showing our struggles, showing us crying. They don’t show our beauty, our celebration of life." Ibanez wants “Undocumented Tales” to last five seasons. Season two debuted last year on YouTube. 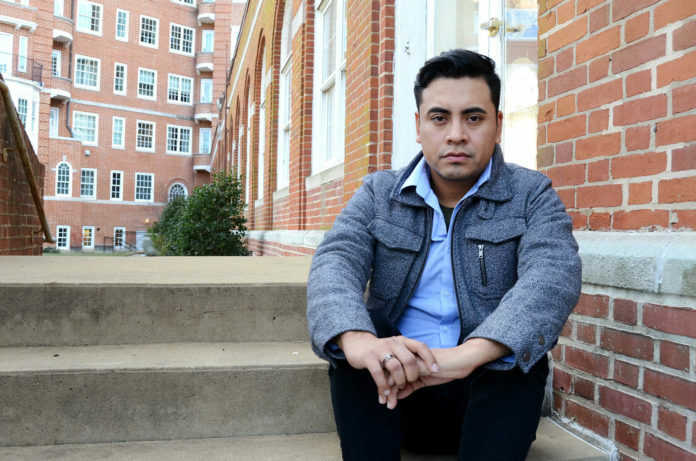 During those six episodes, Fernando continued on his journey to find his identity as an undocumented, queer man and met people who made him realize that hiding and living a lie is not the right way to happiness. Fernando found a love interest, and Ibanez had his first on-camera kiss." Screening at Ash & Elm Cider Co.
A Screening of Undocumented Tales at Ash & Elm Cider Co.
"Tale as old as time: boy loves boy, but one of them has no papers and whenever they go out on dates only one of them can drink because the restaurant doesn’t take Mexican IDs. OK. Perhaps you don’t recognize this story, but it’s not because it doesn't happen. Latinx stories are hardly represented at all in the entertainment industry and much less told openly and unashamedly in mainstream media as they are in Armando Ibañez’s web series Undocumented Tales. 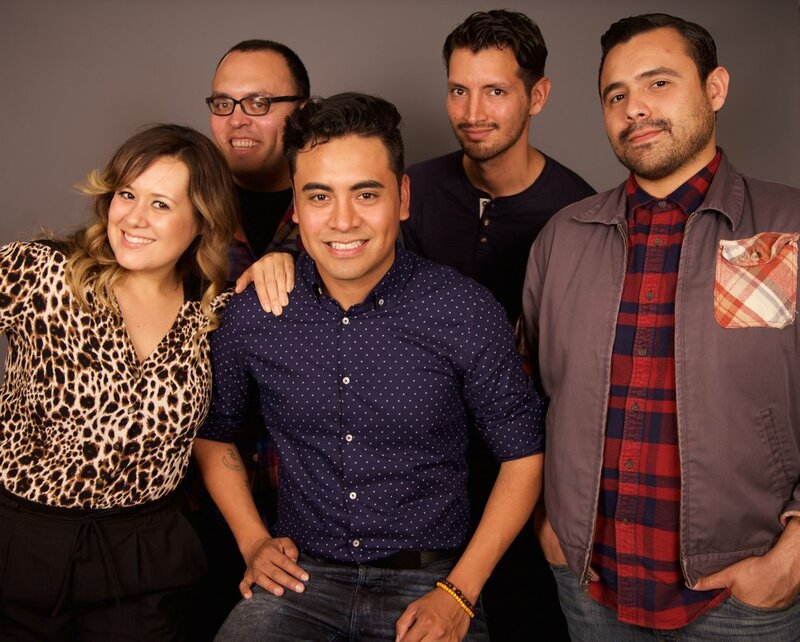 The series, filmed (and set) in Los Angeles, does have its fans in the Hoosier state..."
"Last Thursday, the Cross Cultural Centers (CCC) presented Undocumented Tales: a web series that follows the life of Fernando, an undocumented immigrant who is a closeted gay. Fernando is portrayed by Armando Ibañez, the director and creator of the series. Ibañez sat with Cal State LA students to watch episodes one, two and three of his web series. The episodes highlighted the obstacles and struggles Fernando has to overcome in Los Angeles including: employment, education, love and civil rights for the LGBT community and undocumented immigrants." "Filmmaker Armando Ibañez brings a fresh and original voice to the growing narrative of undocumented immigrants living in the United States. Inspired by his own life, his web series “UNDOCUMENTED TALES” follows the life of a Mexican server in L.A. as he struggles to conceal his sexuality from his family and his undocumented status from the world around him." "La comunidad LGBTQ de Los Angeles apoyó a Armando para realizar la serie. La respuesta fue tan buena que al ver el éxito de la primera temporada de inmediato planeó la segunda, pero al platicar del proyecto con personas que tenían más experiencia éstas le decían que no iba a poder hacerlo, que era un proyecto muy ambicioso, que no estaba listo. Él mismo también pensaba que no estaba preparado, pero se desafió a sí mismo y le vendió la idea a sus amigos del restaurante donde trabajaba para que lo ayudaran a decorar el set. Logró juntar 4 mil dólares en una campaña de fondeo y los usó para comprar comida durante la filmación. 'Hubo casi 300 personas que trabajaron gratis hasta 20 horas en un día. Estamos creando comunidad en el set porque el ambiente es diferente, se respira la pasión, se respira el amor, se siente que la gente cree en el proyecto'. Hoy, Armando Ibáñez se siente más vivo que nunca, siente que quiere hacer todo, quiere escribir más, quiere dirigir, quiere hacer documentales y comedias." "El mundo indocumentado está muy estereotipado. Sí, todos estamos sufriendo, pero también nos reímos, salimos, nos queremos enamorar, luchamos, nos emborrachamos", dice Ibáñez, un mexicano indocumentado de 33 años que vive en California. "En los medios de entretenimiento nos ven solo como víctimas, pero no es así". Ibáñez interpreta al protagonista de la serie, Fernando, un joven gay e indocumentado que trabaja como mesero en Los Ángeles. Al igual que su personaje, Ibáñez creció con ambos secretos por décadas, hasta que decidió aceptar su sexualidad y perder el miedo a vivir abiertamente sin papeles. Esa experiencia inspiró el arco narrativo de 'Undocumented Tales'. "Fernando constantemente le miente a la sociedad por ser indocumentado, y le miente a su familia porque está en el closet", explica Ibáñez. "En toda la temporada va creciendo como persona, y le van sucediendo situaciones que le hacen considerar que mentir no es la opción correcta para ser feliz". Armando Ibáñez, cineasta radicado en Los Angeles, señala que aunque hay programas con personajes latinos LGBTQ, éstos nunca son indocumentados. Esto interfiere con poder identificarse con esos personajes a muchos de la audiencia. Por eso es que él decidió crear su propio programa, Undocumented Tales, que sí incluye un personaje mexicano LGBTQ indocumentado.